My research with the “spiral gingers” involves utilizing a phylogenetic framework to investigate molecular evolution, floral development, and the historical biogeography of the pan-tropical family Costaceae. This family forms an easily recognizable clade within the Zingiberales, distinguished from other families in the order by its characteristic one-sided spiral phyllotaxy and its floral design, featuring 5 infertile stamens fused to form a petaloid labellum. Costaceae presently consists of about 95 species which until recently were placed in four genera: Costus, Tapeinochilos, Dimerocostus, and Monocostus. Recent systematic and developmental studies have led to a novel understanding of evolution within the family and have resulted in the description of three new genera (Chamaecostus, Cheilocostus and Paracostus) to accommodate the phylogenetic diversity of the Costaceae. Costus lucanusianus, a monocot with a bee pollination syndrome. comparing the age of phylogenetic diversification with the geological record to interpret the biogeographic history of this group. Costus pulverulentus, a monocot with a hummingbird pollination syndrome. My lab has several projects focusing on systematics and floral development in the order Zingiberales (tropical gingers). Programs looking at evolutionary patterns in the Heliconiaceae (Heliconia) and Zingiberaceae (Alpinioideae, Zingiberoideae) are underway. The results of these systematic studies are interpreted with respect to pollination biology, floral development, biogeography and molecular evolution at the ordinal level. Ongoing studies also include the evolution of floral development in the ginger order. In collaboration with Dr. Victoria Sosa at INECOL, Xalapa, Mexico, we are investigating the systematic relationships of plants in the Milla complex of the monocot family Themidaceae (Asparagales). This includes genera Milla, Petronymphe, Jaimehintonia, Dandya and Bessera from Mexico as well as several groups from California. This project is funded by the UC MEXUS program. 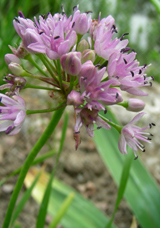 With funding from the Heckard Fund, we are investigating the evolutionary position of California alliums (wild onions) within the worldwide genus (Allium). Preliminary results indicate that the California species may not be monophyletic and suggest an interesting history of adaptive radiation onto specialized serpentine soils. Allium brevistylum from Utah and Colorado. I am interested in biogeographic studies at the population-level, using molecular data to investigate distributional patterns within species and species complexes. Such studies can be combined with analyses of range reductions and genetic diversity among populations in order to provide information for informed conservation planning at the species level and to study the origins of crop plants to help direct genomic research of crop development. 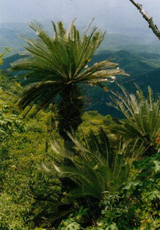 Current projects in this area include Pollination, Gene flow and Population genetics of the Mexican cycad genus Dioon. Dioon purpusii in Oaxaca, Mexico. Photo courtesy of the Palm & Cycad Societies of Florida, Inc.
Chodon Sass, Will J.D. Iles, Craig Barrett, Selena Y. Smith, and C.D. Specht. 2015. Revisiting the Zingiberales: Using multiplexed exon capture to resolve ancient and recent phylogenetic splits in a charasmatic plant lineage. PeerJ. 4-e1584. Specht, C.D. The rise of evo-devo: the Pan American Society for Evolutionary Developmental Biology sets the stage. Am. J. Bot. 103: 1-4. John C. Benedict, Selena Y. Smith, Margaret E. Collinson, Jana Leong-Škorničková, C. D. Specht, Julie L. Fife, Federica Marone, Xianghui Xiao, and Dilworth Y. Parkinson. 2015. Seed morphoanatomy and its utility in recognizing subfamilies and tribes of the Zingiberaceae. American Journal of Botany. Moczek, A.P. et al. 2015. The significance and scope of evolutionary developmental biology: a vision for the 21st century. Evolution & Development. 17(13): 198-219. DOI:10.111/ede.12125. Almeida, A.M.R., Yockteng, R., Otoni, W.C., and C.D. Specht. 2015. Positive selection on the K domain of the AGAMOUS protein in Zingiberales suggests a mechanism for the evolution of androecial morphology in the order. BMC EvoDevo. A.M.R. Almeida, R. Yockteng and C.D. Specht. 2015. Evolution of petaloidy in the Zingiberales: an assessment of the relationship between untrastructure and gene expression patterns. Developmental Dynamics (special issue on Evolution & Morphological Diversity). John C. Benedict, Selena Y. Smith, Margaret E. Collinson, Jana Leong-Škorničková, C. D. Specht, Julie L. Fife, Federica Marone, Xianghui Xiao, and Dilworth Y. Parkinson. 2015. Evolutionary significance of seed structure in Alpiniodeae (Zingiberaceae). Botanical Journal of the Linnean Society. 178 (3): 441-466. Doi: 10.111/boj.12257. A.R. Deans et al. 2015. Finding our way through phenotypes. PloS Biology. DOI: 10.1371/journal.pbio.1002033. Shayla Salzman+, Heather Driscoll, Tanya Renner*, Thiago Andre**, Stacy Shen*, and C. D. Specht. 2015. Spiraling into History: A molecular phylogeny and investigation of biogeographic origins of floral evolution for the genus Costus (Costaceae). Systematic Botany. 40(1): 104-115. DOI 10.1600/036364415X686404. Yockteng, R., Ana M.R. Almeida, Alma Pineyro-Nelson and C.D. Specht. 2014. Chapter 7: Adaptation of floral form: an evo-devo approach to study adaptive evolution in floral morphology. In Mechanisms in Plant Adaptation Roosa Laitinen (ed). Wiley Press. Ana M.R. Almeida*, Roxana Yockteng, James C. Schnable**, Elena R. Alvarez-Buylla, Michael Freeling & C. D. Specht. 2014. Co-option of the polarity gene network shapes filament morphology in the angiosperms. Nature: Scientific Reports, 4: 6194. doi:10.1038/srep06194. Eduardo Ruiz-Sanchez & C. D. Specht. 2014. Ecological speciation in Nolina parviflora (Asparagaceae): Lacking spatial connectivity along the Trans-Mexican Volcanic Belt. PloS ONE. 9(6):e98754. DOI:10.1371/journal.pone.0098754. Roxana Yockteng, Ana M.R. Almeida*, Stephen Yee*, Thiago Andre**, Colin Hill+ and C. D. Specht. 2013. A method for extraction high quality RNA for next-generation sequencing and gene expression analyses. Applications in Plant Sciences. 1(12). DOI: 10.3732/apps1300070. Roxana Yockteng, Ana M.R. Almeida*, Kelsie Morioka+,Elena R. Alvarez-Buylla & C.D. Specht. 2013. Molecular evolution and patterns of duplication in the SEP/AGL6-like lineage of the Zingiberales: a proposed mechanism for floral diversification. Molecular Biology and Evolution 30(11):2401–2422. DOI: 10.1093/molbev/mst137. Tanya Renner & C.D. Specht. 2013. Inside the trap: gland morphologies, digestive enzymes, and the evolution of plant carnivory in the Caryophyllales. Current Opinions in Plant Biology. DOI: 10.1016/j.pbi.2013.06.009. Ana M.R. Almeida*, Andrew Brown+ & C.D. Specht. 2013. Tracking the development of the petaloid fertile stamen in Canna indica: Insights into the origin of androecial petaloidy in the Zingiberales. AoB PLANTS. DOI: 10.1093/aobpla/plt009. Luke J. Harmon, J. Baumes, C. Hughes, J. Soberon, C.D. Specht, W. Turner, C. Lisle, R. Thacker. 2013. Arbor: comparative analysis workflows for the tree of life. PLOS Currents 5. DOI: 10.1371./currents.tol.099161de5eabdee073fd3d21a44518dc. Eduardo Ruiz-Sanchez and C.D. Specht. 2013. Influence of the geological history of the Trans-Mexican Volcanic Belt on the diversification of Nolina parviflora (Asparagaceae: Nolinoideae). Journal of Biogeography. 40(7): 1336-1347. DOI: 10.1111/jli.12073. V.S.F.T. Merckx, J. Kissling, H. Hentrich, S.B. Janssens, C.B. Mennes, C.D. Specht and E.F. Smets. 2013. The phylogenetic relationships of the mycoheterotropic genus Voyria and their implications for the early biogeographic history of Gentianaceae. American Journal of Botany. DOI: 10.3732/ajb.1200330. V.S.F.T. Merckx, E.F. Smets and C.D. Specht. 2013. Biogeography and conservation of mycoheterotrophic plants. In V. Merckx [ed. ], Mycoheterotrophic plants: The Biology of Plants Living on Fungi. Springer Science, New York, NY. C.D.Specht, Roxana Yockteng, Ana M.R. Almeida*, B.K. Kirchoff, W.J.Kress. 2012. Homoplasy, Pollination, and emerging complexity during the evolution of floral development in the tropical gingers (Zingiberales). Botanical Review 78: 440-462. H. Maas-Van de Kamer, P.J.M. Maas and C.D. Specht. 2012. Costus loangensis, an exciting new species from Gabon. Phytokeys 18: 11-18. A. Angelova, Z. Shenghuo, Y. Lin, J. Wong+, and C.D. Specht. Development and deployment of a large-scale flower recognition mobile app. NEC technologies report, 2012. V.S.F.T. Merckx, S.B. Janssens, N.A.Hynson, C.D. Specht, T.D.Bruns, and E.F. Smets. 2012. Mycoheterotrophic interactions are not limited to a narrow phylogenetic range of arbuscular mycorrhizal fungi. Molecular Ecology, 21(6): 1524-1532. doi: 10.1111/j.1365-294X.2012.05472.x. T. Renner* and C.D. Specht. 2011. Escaping the trap: Redefining carnivorous plant gland evolution in the Caryophyllales. International Journal of Plant Sciences 172(7): 889-901. A. Carroll** and C.D. Specht. 2011. Understanding plant cellulose synthases through a comprehensive investigation of the cellulose synthase family sequences. Frontiers in Plant Genetics and Genomics (Front. Plant Sci.) 2:5. M.E. Bartlett* and C.D. Specht. 2011. Changes in copy number and expression pattern of the TEOSINTE BRANCHED-like genes in the Zingiberales provide a mechanism for evolutionary shifts in symmetry across the order. American Journal of Botany, 98(2):227-243. David B. Wake, Marvalee H. Wake and Chelsea D. Specht. 2011. Homoplasy: from detecting pattern to determining process and mechanism of evolution. Science. 331:1032-1034. Kress, W. J., M. Newman, A. Poulsen, and C. D. Specht. 2007. An analysis of generic circumscriptions in tribe Alpinieae (Alpinioideae: Zingiberaceae). The Gardens’ Bulletin Singapore 59: 113-128. Davis, J.I., G. Petersen, O. Seberg, D.W. Stevenson, C.R. Hardy, M.P. Simmons, F.A. Michelangeli, D.H. Goldman, L.M. Campbell, C.D. Specht, and J.I. Cohen. 2006. Are mitochondrial genes useful for the analysis of monocot relationships? Taxon 55:857-870. Sjölander, K. and Specht, C.D. “Functional prediction through phylogenetic inference and structural classification of proteins.” 2007. In R. Apweiler [ed. ], The Encyclopedia of Genetics, Genomics, Proteomics, and Bioinformatics. J. Wiley & Sons, Ltd., West Sussex, UK. Specht, C.D. 2005. “Phylogenetics, Floral Evolution, and Rapid Radiation in the Tropical Monocot Family Costaceae (Zingiberales).” Pp. 29-60 in A.K. Sharma and A. Sharma, eds. Plant Genome: Biodiversity and Evolution. Science Publishers, Inc. Enfield, NH. Kress, W. J. and C. D. Specht. 2005. “Between Cancer and Capricorn: phylogeny, evolution, and ecology of the tropical Zingiberales.“ In I. Friis and H. Balslev, eds. Proceedings of a symposium on plant diversity and complexity patterns - local, regional and global dimensions. Biologiske Skrifter, The Royal Danish Academy of Sciences and Letters, Copenhagen. Stevenson, D.W., Davis, J.D., Freudenstein, J.V., Hardy, C.R., Simmons, M.P., and Specht, C.D. 2000. “A Phylogenetic analysis of the Monocotyledons based on Morphological and Molecular character sets, with comments on the placement of Acoris and Hydetellaceae.” Monocots: Systematics and Evolution. Eds K.L. Wilson and D.A. Morrison. CSIRO:Melbourne.